One-piece, high clearance front crossmembers give plenty of ground clearance for improved off-road performance. New lifted knuckles maintain proper steering and ball joint angles. Rear: 6.25" lifted blocks, u-bolts and hardware. Shocks: Kit includes (4) N2.0 series shocks. If equipped with factory 17" wheels, then 17" or larger aftermarket wheels must be used. 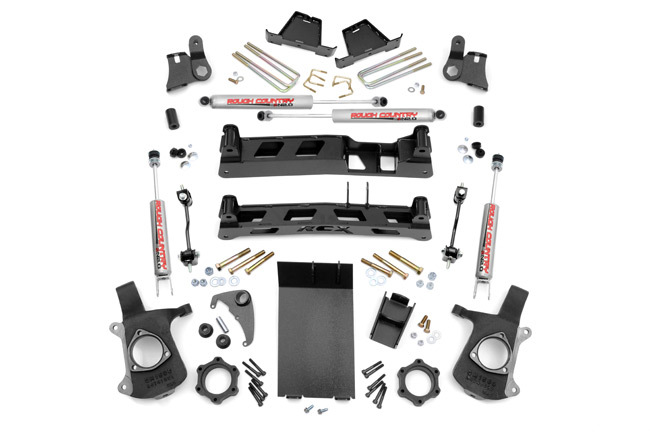 Steering Stabilizer - improves handling and tie rod and ball joint wear and tear.